You may have picked up on my recent fascination with large, jungly-looking plants. I don’t really have room for such colossi in either garden, but I can still admire them when visiting others’. 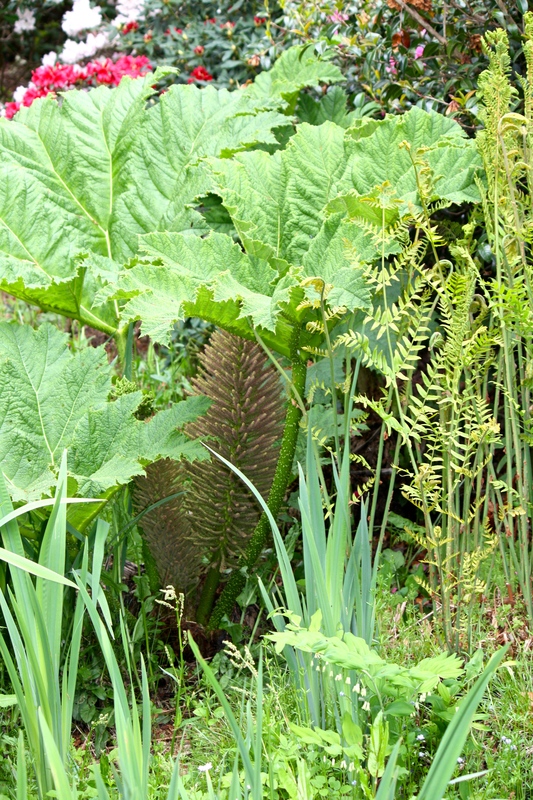 My first encounter with giant rhubarb, Gunnera manicata, was as a child at Glendurgan in Cornwall, where one can still walk beneath the roughly corrugated, spiny leaves and imagine being deep in the jungle. Standing in the eerie light beneath one of the elephantine leaves, one can either fantasize about hiding from a pterodactyl, or simply shelter from a passing rain shower. A long way from the South West of England, giant rhubarb is native to the cloud forests of South America. Here the leaves can grow to as much as 10ft across, making it one of the world’s largest perennial plants. In the UK it finds itself at home in much the same conditions as the tree fern, Dicksonia antarctica: where there’s deep, damp, nutrient rich soil and shelter from wind and cold. If the prodigious leaves are not impressive enough then the flower heads are more so – one metre tall, feathery cones of red and green that look distinctly primeval. They start to emerge early in spring, before the leaves really get going, and expand to look like giant fox tails. Close up, they are quite fascinating. 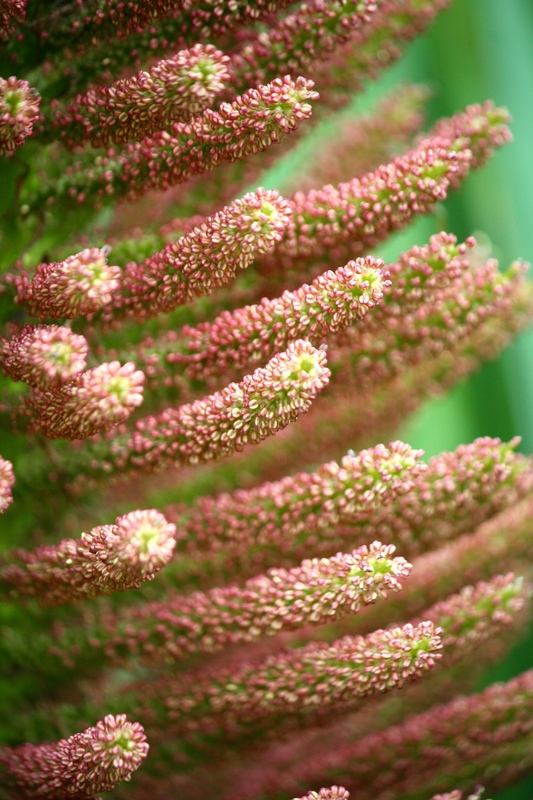 Gunnera manicata likes to grow in close proximity to water, whether bog garden or pond, and is not a plant to be forced into a pot or confined in a small space. Planted generously alongside other moisture lovers it will always draw gasps of delight, especially from anyone with a vivid imagination. Most of the great Cornish gardens have extensive clumps of giant rhubarb, but I can recommend Glendurgan and neighbouring Trebah especially. 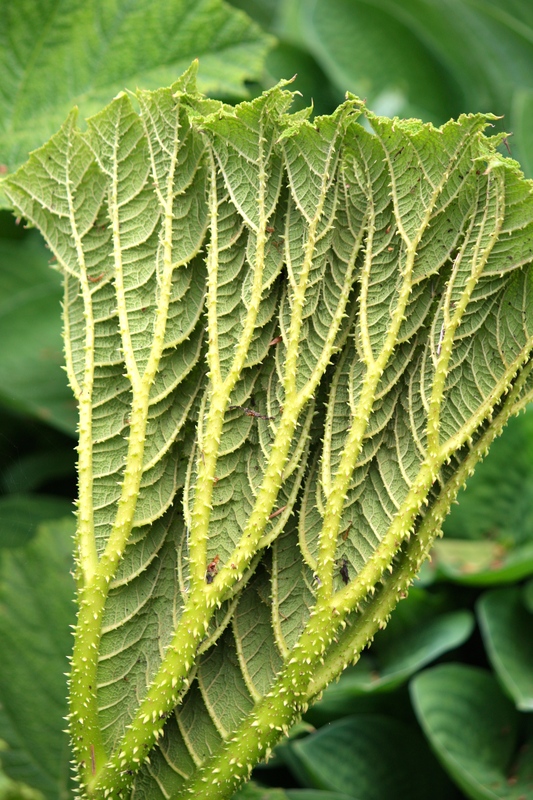 In Dorset, Abbotsbury Subtropical Gardens are famous for cultivating plants with some of the largest leaves in Britain. The Savill Gardens in Windsor Great Park and Logan Botanic Garden in South West Scotland are also great places to see Gunnera manicata in its element.